All text and photographs of "The Six Plants I Can't Live Without" are original and copyrighted. This post was written by Meems for my blog Hoe and Shovel, Tampa Bay Area, Florida. Every photograph may click to enlarge. Side note: All photographs in this post were taken this week unless otherwise documented. Can I just tell you what a challenge it is to pick only six plants I can't live without? It's important to me to open with an undeniably pretty plant. I'll start with what I probably (because "probably" leaves me a way out if I change my mind) consider to be my all-time favorite perennial plant growing at Hoe and Shovel. Although not a native, it is considered to be a Florida friendly plant. As a matter of fact all six of my choices are either native or Florida friendly. 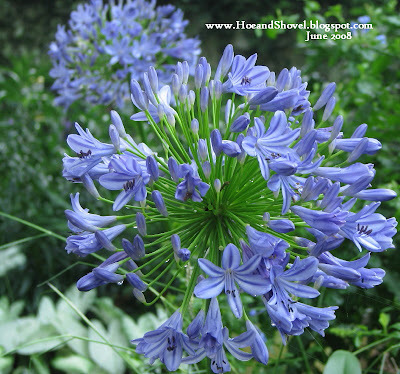 The flowers of Agapanthus explode from a small bud on the end of stalks that stretch high above the pretty green plant. When in bloom (typically May-June) they are stunning. When not in flower the plants themselves serve as year-long greenery filling in lots of places in the garden. The leaves of the plant are sturdy, over-arching and I would describe them as a bit leathery but shiny and smooth. It is a low maintenance plant through the hardest of times. Whether the drought of summer or the occasional (and abnormal) freezing temps of winter the evergreen plant stays upright and hardy in all conditions. You can read more about them from past posts here. A Tree Is A Plant Right? Quercus geminata, sand live oak trees. So when contemplating and finalizing my thoughts on the 'six plants I can't live without', in the end, I decided some of them were not necessarily the prettiest or brightest or most colorful plants in the garden. No, the majority of plants I love the most are the foundational plants. The ones that endure season after season and year after year. The ones I wouldn't want to think about trying to replace because they are such fixtures in my garden. Like the stands of oak trees in my front yard (shown above) that allow me to garden in a microclimate of filtered shade right through the middle of what can be a long, hard summer to many plants in our area. More live oaks in the back garden. A closer look at the understory of the oak trees reveals the dramatic fans of the native palmettos at the base. Along with the well-established trees the palmettos were here long before the house was built. The decidedly green leaves are 2-3 ft across. The cluster of leaves gets about 4-6 ft high with a similar spread. The leaf stems are about 2 ft long and sharply saw-toothed. It sends out a black round fruit about an inch in diameter when ripe. Many animals feed from those fruits. As is the case with this clump in my back garden it can develop an erect or arching trunk that may lift the whorl of leaves 2-8 ft above ground. This one is sporting the beginnings of its spring bloom. You can read more about these plants at Floridata here. Also considered Florida friendly, this moderately large-leaved, easily-grown philodendron makes a dramatic, tropical statement wherever it is used in the landscape. I've dug these plants up, split them into two or three at the roots and transplanted them to many locations in the understory of my garden. Over time they also self multiply by growing more trunks and leaves from the base of the plant. Most of the time you'll see them jammed right up next to holly fern, variegated schefflera, variegated shell ginger and/or agapanthus. The above photo is from the front garden. This clump was pretty hard hit by the two winter freezes we just had. Until then you couldn't see the trunks for the mass of lush greenery. Thankfully, these are coming back pretty quickly. Some might argue I have way over-used this simple plant. I might actually argue I have way over-used this simple plant. That's okay, it's probably true, but I don't mind. 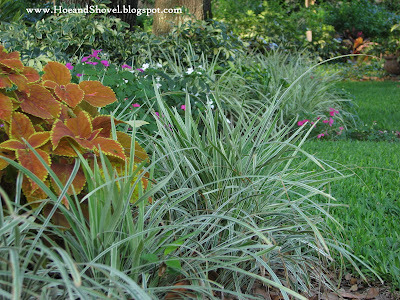 Liriope is tough, easy to grow, easily multiplied by dividing the plants and extremely low maintenance. I have planted hundreds of them as borders to highlight my curvy beds. Because they are lighter in color the contrast they provide is pleasing to the design. 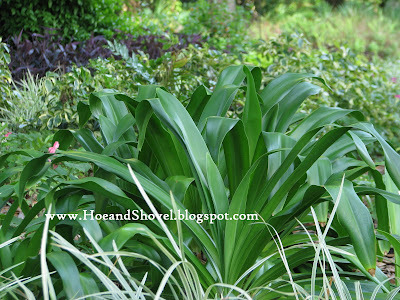 I'm especially fond, also, of the larger variety, Liriope muscari, that isn't variegated. It is used to create natural pathways (not pictured) in the front garden. Unlike what one typically sees of this plant it might surprise you to see that mass plantings of them stand waist high under the shady oak trees. The fancy-leaved caladium, Caladium x hortulanum, is the most commonly grown species of caladium and is a species of hybrid origin. Florida's own Lake Placid claims to be the caladium growing capital of the world. 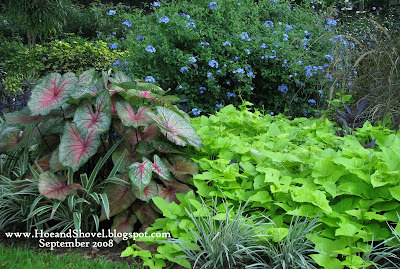 Appropriately left until last, if I had a signature plant for Hoe and Shovel it would be the caladium. I plant hundreds of bulbs of many varieties every year. 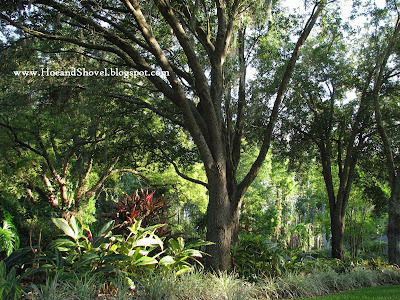 In Florida we depend on foliage for color to some extent more than blooms. As spring wanes, and the heat and humidity are with us 24 hours a day, our foliage plants become the mainstay in our gardens. Just this week I've started seeing the first signs of caladiums pushing their way out of the ground. I'll wait until they are all up before I plant the new bulbs. 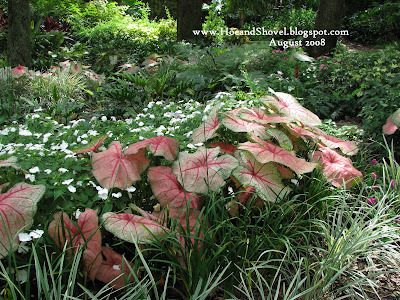 It won't be long and the garden will be flourishing with mass plantings of all sorts of caladiums and Hoe and Shovel will once again feel like summer. Thanks to you for coming along for the tour. And a special thanks to Steve Bender in Hoover, AL, The Grumpy Gardener at Southern Living, for hosting and participating in "The Six Plants I Can't Live Without." Now the question that begs to be asked... do you have "Six Plants You Can't Live Without?" Rich Florida flavor to this fantastic post, Meems. What six plants could I not live without? Hmmmmm...it would certainly include the live and scrub oaks. Hibiscus and azaleas for landscaping color, and beautyberry, wild blueberry and rusty lyonia - some of my favorites that grow uncultivated in the thickets by the creek and under the pine trees in the pasture. If I could pick a 7th plant, it would be the tall pine trees that attract the numerous fox squirrels with which we share Pollywog Creek. What I like the most about the blogathon is seeing that there are DIFFERENCES based upon zones and growing conditions as well as gardener's favorites. Your gardens are so lush and yes, tropical and exotic to me. Some of your favorites won't grow here at all and others have to be annuals in my zone. Great list and I love that you included some of your native Floridians! I just can't imagine Florida without oak trees in my yard and yet so many of the massive subdivisions were built on abandoned orange groves and lot after lot is barren of trees. When we were house shopping all those 26 years ago oak trees were a must for us. The front was well endowed while the oaks in the back were all planted by me as very small starter trees in 1991. Our neighborhood also has loads of tall longleaf pines and I love them but kind of glad we don't actually have them in my yard. Your other choices are great Florida winners too. Thanks for following along. Gosh yes Meems. I could tell I was in the tropics when I looked at your faves. Your garden is so pretty. I always enjoy seeing these plants growing in your garden that I would have to have in a pot so I could bring them inside during winter. Great choices. I can see why these six are your favorites Meems! Your beautiful oaks and the shade they provide must be especially wonderful during your hot, humid summers, and must make working out there a lot more tolerable on hot days. Caladiums are one of my faves even though they're far from hardy here. 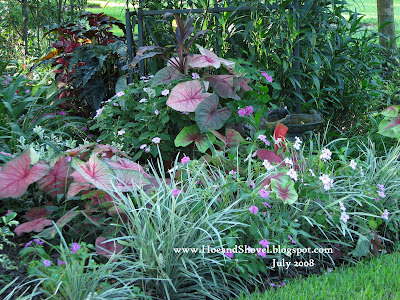 Few plants or blooms can top the beauty of caladium foliage, so hardy or not there's a place for a few in our garden. Lovely choices, Meems--the caladiums didn't surprise me at all:) I've just been to Frances' and Pam's to see their posts, and it's interesting to see the different choices. But the key here, I think, is that each of you has chosen what does well in YOUR garden. Your choices show that beautiful tropical effect that I enjoy whenever I visit here. Meems, I can see why you chose those. Each one adds to the lush, tropical feel of the garden. We actually have a gardener here that uses caladiums. She plants, or rather her staff plants thousand of bulbs each spring and digs them all up every fall to overwinter out of the freezing temperatures. Great post and wonderful choices. I too, am seeing Caladiums poking their little heads out of the soil. As always, Meems, your landscape is gorgeous and inspiring. We have one of the aforementioned ex-orange grove landscapes (what can I say, the floor plan was irresistible), and have compensated with several specimen single-trunk crape myrtles from a local nursery. They're the tallest things in the neighborhood until the live oaks catch up. So, with smaller planting areas, my faves tend to be flowering...hollyhocks, bearded irises, echinacea, cape daisies, gazanias. I needs my blooms! Meems-I think you covered my 6 must haves too.What I really enjoy about the Live Oaks(we have one that we know is over 35 years old)is how much cooler the temeperature is under them. Great post-now,I'm off to visit the others. Wonderful Meems! Your list is perfect. We can grow some of them in Raleigh. I try Agapanthus each year, and each year it gets bit. I love it though and love the Live Oak. I think it is one of my fave trees. I love the way you've unabashedly included litiope and caladiums. 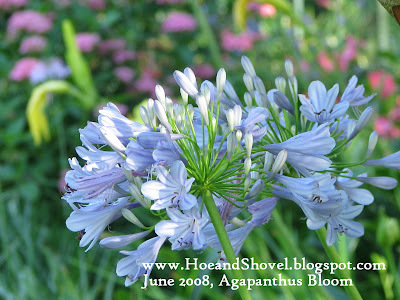 I love agapanthus and look forward to the time I can grow it again. Live oaks are so appealing -- and, of course, often get draped with the Spanish moss that's included on Steve Bender's list. I'm not surprised by your lovely choices, Meems. The first 3Agapanthus africanus, Live oaks, and palmettos are my favorite Florida plants, very different from those we see in the Midwest. Thanks for the tour, Meems -- your choices are good ones, all well suited to your area, I should think. Lovely. Meems, I am salivating over your agapanthus. Every year, I try supposedly "hardier" ones here in north-central Alabama and they always break my heart. 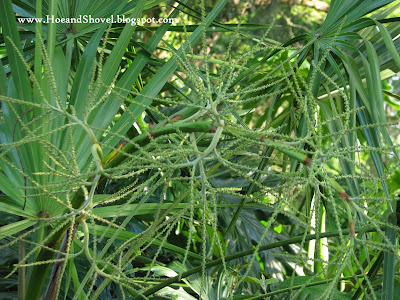 Love the saw palmetto too. It's very underused, especially the silver form. Oh what the heck, you could probably take all of your favorite six out of your garden and it would still look great! I feel so inferior. Some great choices, Meems. You have my vote on live oaks, agapanthus, variegata liriope (it's impossible to have too much liriope of any kind) and caladiums. They are "must haves" in the Florida garden. To those four I would add Knock-out roses and pentas. You just can't beat these two for outstanding color and heat resistance. I agree... the differences in zones, personalities and garden styles are what makes this kind of meme very fun. The longer I garden I'm learning more and more to go with the Florida flow rather than fight it. These days I'm embracing it with much affection. Thanks... I can always count on you for loving the tropicals.Some of them are more Florida friendly than others. The freezes we had in January have given me lots to re-think. When the sun is overhead I follow that shade around the best I can. It is typically many degrees cooler especially this time of year when the humidity is down. I know you love caladiums and I'm always thrilled to see yours growing, too. So glad you came over from the other entrants' blogs. I think you've pointed to the interest in doing a meme like this where each participant tells what works in their own plot of ground. Mine being the furthest south certainly does have the tropical flair we adore down here. 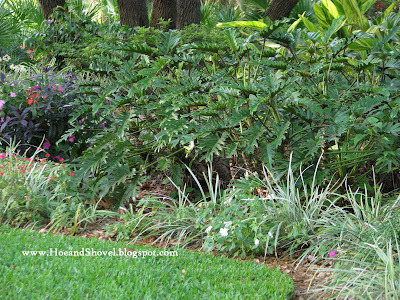 Emphasis on "her staff"... if one is willing to do the digging up in zones north of here caladiums are a good choice. I leave mine in the ground and many times dig them up by default when planting on top or around them in other seasons. The oaks in the front were there and of course much smaller when we moved here 25 years ago. But those beds are where I began my quest to transform the landscape. The entire back yard was a field of grass. It has become this gardeners main playground over the last ten years. I missed my trip to Tally- I'll e-mail you... glad your caladiums are popping out too. Oh, I love single trunk crepes... very nice. You've made the most of your sunny garden and after all those veggies do love sun. Mine have to get theirs in the first 3/4 of the day or they miss out from the shade of the oaks. don't blame you on the flowers... I can't believe you grow bearded iris... I haven't even tried -sticking with louisiana and african varieties. I keep wanting to try the hollyhocks but not brave enough yet... I only have so much sun to share with limited choices. :-) Hey- thanks also for the ID on the daylily the other day- I think you're absolutely right and I've had that variety for years... you know how our nurseries don't name the cultivar... everything just says DAYLILY. Gotta love Florida! You would me one to understand my "reasoning" on the foundation plants and natives. Isn't it true? At the end of the day these are the choices I would begin any Florida garden with and build from there... of course six plants just isn't enough for any garden but it's a very good start. My oak trees are the stalwarts I admire in every season. They provide my entire garden with all the mulch needed to cover the beds, too. All my plants are grateful for the cooler temps they offer under the dappled shade. Thank you. So glad to be introduced to your blog by way of this meme. After our two highly unusual freezes this winter the agapanthus was moved to an even higher place in my admiration. It was not the least bit fazed while other plants I also love wilted under the pressure. Right now it is my East Palatka Holly tree that is draped with spanish moss... strange I think... I keep forgetting to do some research on that one. I'm so used to seeing the spanish moss I forget how unique it is to some. I absolutely love traveling the roads near your sister's place on Amelia Island... with the oaks draping over the roads and the palmettos leading right down to the sandy dunes of the beach in places. Thank you. You are right- well suited for this area... I'm learning better all the time how to work WITH nature. I wouldn't even want to imagine it without my six but we would surely learn to manage albeit a whole different world. PENTAS! I went back and forth on that one... they are standard fare here - like you- growing to 3 and 4 feet and serving up so much entertainment with the butterflies hovering around them... AND they never stop blooming! Meems, I'm enjoying your selections tremendously. You wrote, "As spring wanes, and the heat and humidity are with us 24 hours a day, our foliage plants become the mainstay in our gardens." That is so true for Austin as well during our long summer that stretches from May to October. Only we lack the precipitation that your garden probably receives, so our foliage choices must be xeric if the plants aren't to require babying. And I LOVE the silver saw palmetto. I've seen it growing in Austin, but I know our alkaline soils aren't to its liking. So I'm trying a silver Mediterranean fan palm instead. Yours were the choices with which I could best identify, except for the philodendron, and Susan's additions are mine, too. We all fare best when we bloom where we're planted. Wow - beautiful post and congratulations on whittling it down to 6. I know how hard that must have been. Many on your list are favorites of mine, too, and grow well here in Central Texas. And they all look amazing in your garden. I enjoyed reading about your favorite plants. The echinacea in your header is so stunning it takes my breath away! We count the days until the afternoon thunderstorms start to roll through for much needed rain after our dry spring. I sure hope the fan palm works out for you... it will blend nicely with your agaves. 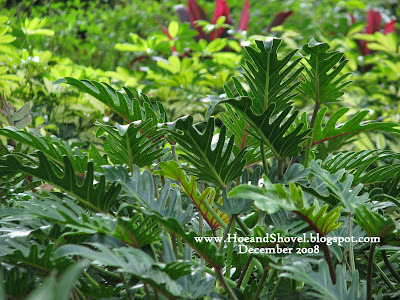 I also depend on the giant philodendrons in several places in the garden. They take up big spaces in my big spaces. Six was a hard call but kept me focused for sure. Austin is more like north Florida (zone 8)but it's nice to know my picks work for other gardeners too. I'm glad you stopped by. The echinacea is in my new sunny bed with some other (native) wildflowers newly planted. I loved that you picked mainly foliage or the plants that provide structure & backbone to your garden Meems. It's about time some of the plants we take for granted get some glory. :) Your Agapanthus is gorgeous though, I'm not sure if they are hardy here. I agree with your 6 and they are favorites in my yard. I also like the Hope Philodendron which is a dwarf form of the tree philodendron and stays 5 feet tall and clumps to 10 feet in diameter. It never needs pruning, always looks good and has for 25 years. The Xanadu looks good for about 5 years and then needs to be cut and the tip replanted. Another varieation on the saw palmetto is the Silver or Blue east coast form which brightens the garden and offers different design and color options. Both of these plants are more readily available now and worth seeking out. Great pictures, as usual. Melianthus major, Aloe marlotii, Tetradenia riparia, Cyrtanthus sanguineus, Clivia miniata var citrina, Dais cotinifolia: 6 of my favorite African plants in my garden to go with your lovely Agapanthus. It's fun to see your tropical Florida friendly choices, Meems- nice choices, although it's harder for a person with a 1/4 acre yard to want a live-oak. You have lots of space and all your favorites look good in your garden. I can't resist trying to make agapanthus & caladium live in mine, too, but Pam/Digging is more realistic about the chances of agapanthus in Austin - guess that's why she gave her Lily of the Nile to me! That would be SO hard to pick only six Meems. I always go for pretty so of course I love your first choice the agapanthus!! I finally bought myself one last summer and overwintered it in my basement so I wouldn't lose it. Congrats on being asked to participate too ~ your garden is a perfect choice. Oh, do you philodendrons bloom??? One of my friends has a beautiful plant in her office that has been putting out gorgeous "calla like" red blooms. I keep wanting to post about it. I would be delighted if I could have that philodendron growing like that in the yard, no less! We're fairly tropical here in many ways, humid-wise. But that's one thing I never see around here. At least I haven't yet! Isn't it the truth? All the other plants in the garden are like ornaments on the Christmas tree. Without our foundation plants the ornaments aren't as pretty in their special places. 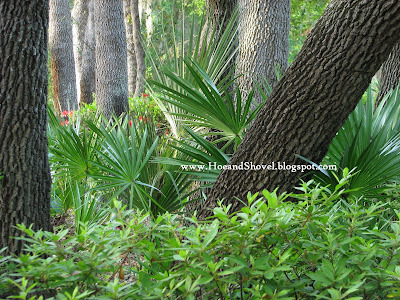 I have seen some beautiful blue palmettos sited correctly in other gardens. I'm not aware of that issue with the xanadu and not sure I know what you are saying- will have to do some research. Great choices. That aloe must be gorgeous. I think your little gem magnolia is perfect for your 1/4 acre. I'm cheering you on to defy the odds on the agapanthus and caladium. Can't wait to see your agapanthus. My philodendrons bloom and honestly I think nothing of it. Maybe I should make more of its efforts. Maybe our acidic soil is more to its liking??? Can't be sure. Hi Meems, I wish I could see your gorgeous yard in REAL LIFE. It has got to be the most gorgeous yard in your area. WOW!!!! I love those live oak trees also. We don't have them up here. And one of my fav's is Caladium. I 'tried' to grow them here--but it's just too cool. I have to stick to hosta which is not nearly as pretty. what a cool thing to participate in...i know i read your post the other day but had no time or energy to comment. 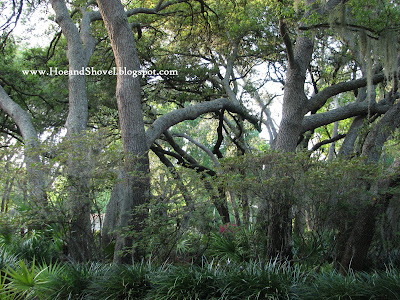 i love your big live oaks...they really are what make your home and garden truly special. i also love that you put so many caladiums...when they are all blooming it is spectacular around your place. Very cool plants! I visit the in-laws in Florida every once in a while, and it seems like an expanse of parking lots, very wide streets, squishy lawn, and some viny things I can't identify. If THIS is Florida, maybe I can go for a longer visit next time.